Brussels Midi station . . .
How long to allow for connections in Brussels? Brussels Midi is the main hub station used by all mainline trains serving Brussels including Eurostar to London, Thalys to Paris, Amsterdam & Cologne, German Railways ICEs to Cologne & Frankfurt, Intercity trains to Luxembourg and Belgian domestic trains to Bruges, Ghent, Antwerp & so on. Changing trains is easy and only takes a few minutes. The station is Bruxelles Midi in French, Brussel Zuid in Flemish, Brussels South Station in English - it's all the same place. I have to admit that Brussels Midi isn't my favourite station. The main concourse (couloir principal) is a wide and somewhat gloomy street-level passageway underneath all the tracks, which pass overhead on a viaduct above street level. There are escalators and stairs up to each of the 22 platforms. A similar but much narrower passageway connects all the platforms a hundred yards to the south, called the couloir sud. Incidentally, Brussels Midi was originally opened as a terminus in 1869. Brussels Nord was also originally a terminus. In 1952, the 3.8km Jonction Nord-Midi line opened through the centre of Brussels linking Brussels Nord, Brussels Central & Brussels Midi. This turned Nord & Midi into through stations and enabled Brussels Midi to become the main hub for all trains serving Brussels. There are 22 platforms, numbered from northwest to southeast. Check the departure screens and boards to see which platform your train leaves from. The tracks are above ground level, there are escalators and stairs to & from from the ground-level concourse below. Eurostar normally uses platforms 1 & 2 on the northwest side of the station, accessed via the Eurostar ('Channel') terminal. When the Eurostar in question is one that runs through to/from Amsterdam it will use platform 3, also then accessed via the Eurostar ('Channel') terminal. Thalys trains to & from Paris, Rotterdam, Amsterdam & Cologne use platforms 3, 4, 5 or 6. ICE trains to & from Cologne & Frankfurt also use platforms 3, 4, 5 or 6. Belgian domestic trains to Bruges & Ghent leave from platforms 9-16. InterCity (IC) trains to Rotterdam, Den Haag & Amsterdam leave from platforms 12-19. Arriving in Brussels by Eurostar? After stepping off a Eurostar from London you walk past the front of the train off the end of the platforms and down the escalators, exiting the Eurostar terminal onto Brussels Midi main station concourse, which is a wide passageway underneath all the tracks spanning the width of the station. But if you're catching an onward train, there's a short cut explained here. Leaving Brussels by Eurostar? When heading back to London by Eurostar, you must check in at least 30 minutes before the Eurostar leaves (10 minutes with Business Premier tickets) by passing through the automatic ticket gates at the entrance to the Eurostar terminal. This is just off the main station concourse underneath platforms 1 & 2, now marked Channel Terminal'. After the check-in gates comes the usual fairly painless X-ray security check then Belgian passport control followed by UK passport control, then you wait in the Eurostar departure lounge (where there's a cafe & bar) until your Eurostar is ready for boarding. Then it's up the escalators or lift to platform 1 or 2 an onto the train for London. An ICE to Cologne about to leave from platform 5 at Brussels Midi. The escalators lead down to the main concourse below the tracks. Platforms 1-6 have been modernised, platforms 7-22 retain a more 1950s feel! First, a reality check. There are 22 platforms, but you can stroll from platform 1 to platform 22 in less than 3 minutes. And if all you are catching is a Belgian domestic train to Bruges or somewhere, these usually run every 30 minutes and your ticket is valid on any train, so if you miss your planned train simply take the next one, no big deal. Obviously, you should allow much longer than that when connecting with an important mainline train on which you have a train-specific ticket, in case your first train arrives late. If connecting into or out of Eurostar to or from London, I'd allow at least 20 minutes to change trains in Brussels on an outward journey from London. On the return journey towards London, I'd allow at least 40 minutes to change trains including the 30 minute Eurostar check-in - and if your first train is a little late, don't worry, Eurostar don't close check-in exactly at the 30-minute cut-off like airlines do, in practice they'll probably rush you through even with 10 minutes before the Eurostar leaves. You'll often see journey planners suggest a 20-minute connection between a London-Brussels Eurostar and a Brussels-Cologne-Frankfurt ICE, this is fine. This is a recognised connection which you'll safely make even if the Eurostar is 10 minutes late & the short cut is closed. I've even known the ICE to be held a few minutes for a late-running Eurostar. If you miss a connection in Brussels with a train-specific ticket, see the advice on missed connections here. Under the CIV international conditions of carriage and the Railteam promise, if you miss a connection because of a late running train, staff on board the late-running train or in Brussels international ticket office should stamp your ticket and allow you to take the next departure even if your ticket is theoretically non-changeable, please read the detailed advice here. Update: This short cut was closed from Nov 2015 but reopened in May 2017. It is now open except when they do random checks for boarding Thalys or ICE trains. Is this short cut open at the moment? The short cut was closed in late 2015 due to heightened security, but reopened in early 2017. You might occasionally still find it closed when they do random security & ID checks for ICE & Thalys departures or if Eurostar are short-staffed, but normally it's now open. 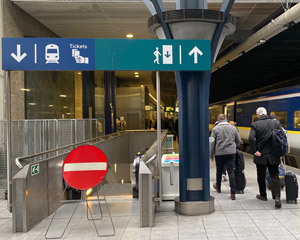 Instead of following the crowd shuffling slowly off the end of the Eurostar platform, look for the down escalators marked Correspondances - connections half way along the Eurostar platforms, roughly level with Eurostar car 11, see the photo on the right. Nip down this to the South Corridor (Couloir Sud) which runs underneath the tracks linking all the platforms, quickly check the indicator boards then nip up an escalator again to the right platform for your onward train to Cologne or Amsterdam. Using the Couloir Sud avoids the crowds and saves a useful few minutes compared to walking round via the main concourse if you've a tight connection. Indeed, I have made it at normal walking pace from the doorway of a Eurostar arriving on platform 2, all the way to platform 20 for an onward train to Antwerp in all of 2 minutes 30 seconds. Note that this short cut doesn't work in the London-bound direction, as you need to check in at the Eurostar (Channel) terminal off the main concourse. You can see exactly how to use this short cut in this London to Cologne video guide, the principle is the same whether going to Cologne or Amsterdam or anywhere else. Brussels Midi isn't my favourite station, I have to admit. But it has an increasing range of cafes and shops. Minimarket: The best place to stock up for a journey with snacks, food and wine or beer is the Carrefour Express minimarket opposite the entrance to the Eurostar terminal near platform 1, marked with a trolley symbol on the station map. Left luggage: There are left luggage lockers and a staffed left luggage office at Brussels Midi if you want to stash your bags while exploring Brussels. It's open 24 hours, just off the main concourse near the Eurostar terminal, see here for left luggage prices. 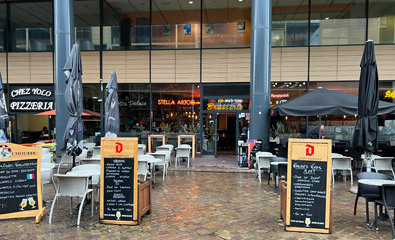 The friendly Brasserie de la Gare is a down-to-earth place just across the road right outside the main exit on the north (platform 1) side of the station - the Brasserie de la Gare does good beer and decent food, if you don't mind football on the big screen. I often end up here! At the Grande Place near Brussels Central... 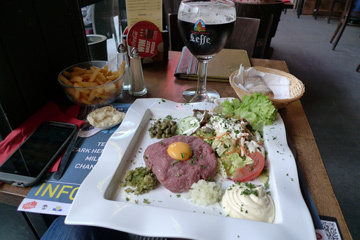 If you've time to hop on a local train one or two stops to Brussels Central and walk 5 minutes to the Grande Place, there are vast numbers of tourist trap restaurants, simply avoid these and try the celebrated Aux Armes de Bruxelles, auxarmesdebruxelles.com, which is one of the very few really good traditionally Belgian restaurants near the Grande Place. Their moules-frites are excellent. For a taste of Belgian beer whilst in Brussels, try the equally-celebrated Delirium cafe near the Grande Place, www.deliriumcafe.be. There's a main entrance on each side of the station at either end of the ground-level concourse under the tracks. This is the entrance on the north (platform 1) side of the station. The large grey arrow indicates the taxi rank. The smaller grey arrow indicates the Pullman Hotel, a good place if you need to stay between trains. The Brasserie de la Gare is on the other side of the road, directly behind the camera. If you walk into the station's north entrance you find yourself on the main concourse. The entrance to the Eurostar terminal is just inside and to your right, signed Channel Terminal. You board Eurostar trains to London on platforms 1 & 2 (or occasionally now, platform 3) after check-in, security & passport control are carried out inside this Eurostar terminal. The main concourse (couloir principal) at Brussels Midi is a somewhat gloomy ground-level passageway underneath all the tracks, spanning the width of the station between the north and south entrances. The train tracks are above ground level, there are escalators & stairs up to each platform. You can see one set of escalators up to a pair of platforms in this photo, as well as the main departure board. The international ticket office opens off the main concourse near platform 3. There's a numbered queuing system. The staffed left luggage office with locker area behind opens off the main concourse near platform 5. The Brasserie de la Gare, just across the road from the main exit on the north (platform 1) side of the station. If you don't mind football showing on a large screen, it does good food and beer and is a decent place to wait for your train. The Ibis Hotel Brussels Midi is just across the road from the station and a good, reliable, inexpensive choice. It's shown on the station plan above if you enlarge and zoom out slightly. Leave the station by the platform 22 exit and turn left. The Pullman Hotel Brussels Midi is more upmarket and part of the station complex on the platform 1 side. The Novotel Brussels Midi is another good choice, located just beyond the Ibis. For somewhere near the city centre and all the sights, try the historic Hotel Metropole, just 5 minutes walk from the famous Grande Place and 10 minutes from Brussels Central station. It's one of Brussels' most famous hotels, in fact the only 19th century hotel still in operation. It's grandeur is a tad faded, but none the worse for that. 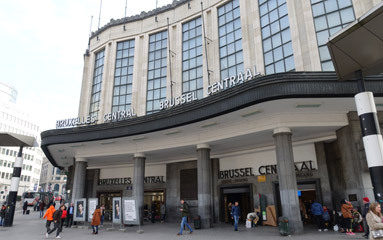 If you have a Eurostar or Thalys ticket to or from Brussels, these allow a free transfer by frequent Belgian domestic train between Brussels Midi and other Belgian Railways station in the Brussels city centre zone including Brussels Central (near the Grande Place), Brussel Nord or Brussels Luxemburg (next to the EU Parliament). Simply hop on any train that's shown as calling at Brussels Central, Brussels Nord or Brussels Luxemburg and show your Eurostar ticket on board if asked (which is unlikely, as I have never known conductors check tickets between Brussels stations). Unfortunately there's no handy Next train to Brussels Central indicator so you just have to walk up and down looking at the individual platform screens to find one leaving in the next dew minutes which stops at Brussels Central. Takes a bit of hunting, but not rocket science. From Brussels Central it's a 5 minute walk to the Grande Place for some moules frites at www.armebrux.be and perhaps a Leffe Brune beer or two at www.deliriumcafe.be. You can get a free tourist map from the dark blue tourist information kiosk at the platform 1 (Eurostar terminal) end of the station concourse near the exit to the street. 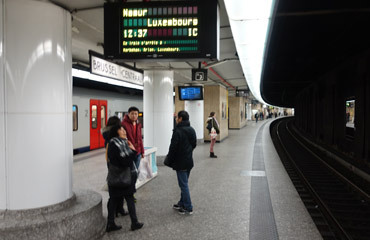 The platforms at Brussels Central are underground. Or walk to Brussels city centre... Click for walking route map. If you prefer to walk, it's a 21 minute 1.7 km (1 mile) stroll from Brussels Midi station to the Grande Place in the city centre. Leave the station from the main doors on the Eurostar terminal (platform 1) side of the station, turn right, walk along the side of the station/tracks for a few minutes and then turn left along the Rue Stalingrad to central Brussels. Bus, tram & metro information for Brussels.